Certified Pre-Loved FLEX-6300 with ATU comes with the 1 year warranty and most recent version of software. The unit has been tested and recalibrated to be prepared for resale. Microphones are not included with purchase but we do have a limited selection of Pre owned FHM-2-RJ45 & FHM-2-8P microphones available. 512-535-4713 ext 1 to place your order over the phone where we will not pre-authorize order payment until time of shipment. 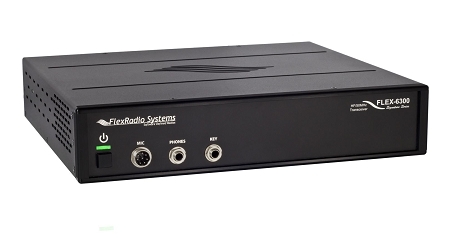 As FlexRadio Systems' mid-range Signature Series SDR, the FLEX-6300™ is a single SCU, dual Slice direct sampling transceiver that provides general coverage HF/6m and with optional features such as a wide-range ATU and front facing handles. The FLEX-6300 is for the amateur operator who wants to experience the magic of software defined radio in the highest performance 100W transceiver family available today. The FLEX-6300 provides an entry point into multi-dimensional amateur radio operations from CW to the latest digital modes. Providing dual panadapters and waterfall displays, as well as two full-performance slice receivers, the FLEX-6300 opens up new operating capabilities at an affordable price.